Are you the life of the party, energizing all around you with your enthusiastic repartee and engaging wit? I do not think that describes most shiftworkers, and it certainly was not characteristic of me when I worked rotating shifts that only provided one weekend off per month. I missed lots of social events. In those days, we worked a backward rotating eight-hour schedule. Due to inadequate staffing, we usually worked 12 hours instead of eight. That type of work life leads to cumulative fatigue. It can also lead to problems with family and social life. Even as a young adult, I needed to use some of my days off to recover from fatigue. 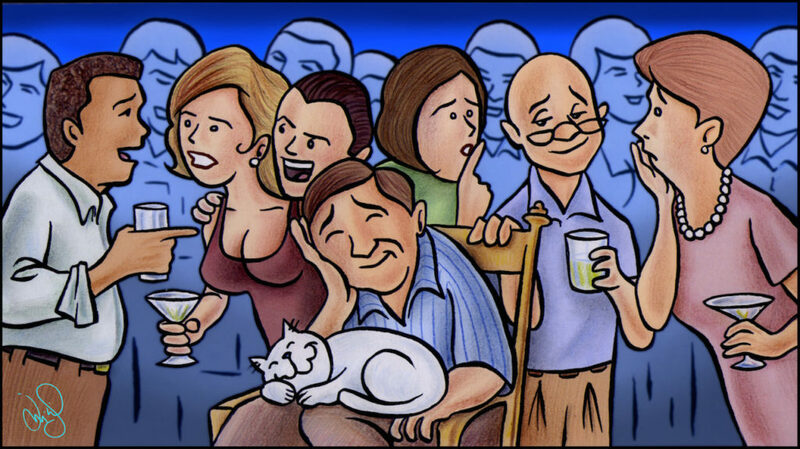 If I went to a social event, my interactions were limited even if I did not have a cat in my lap like the man in this month’s illustration. Consider the “quality of life” of shiftworkers or any employee. What are the important components people seek in a job? At the API Pipeline Conference in 2015, the top five factors were presented of what women look for when seeking a job. They were health care benefits, job security, job satisfaction, salary, and good work life balance. During the presentation, I wondered if those factors could be achieved by a shiftworker. There are challenges in at least two of the five factors. A shiftworker needs to develop intentional strategies and practice discipline to have good work life balance. It requires effort from one’s family to sustain meaningful relationships, particularly when one has young children. The shiftworker cannot participate in all the daily activities and still obtain adequate rest. Spouses may resent having to attend family, school, and other events without their partners, who may be at work or using off time to sleep. To avoid problems, the family should set realistic goals, plan in advance based on the shift schedule, and communicate regularly about both facts and feelings related to work demands and family desires. Although shiftworkers have a higher divorce rate than non-shiftworkers, it does not have to be that way for you. Take a realistic view of both the advantages and disadvantages of shiftwork. Since workdays are compressed into fewer days of the month, there are more days off for family and personal activities. Some people struggle with achieving job satisfaction if they have to work at night. I worked with a man who said he felt like a failure because he went to work when other people were going to bed. I was grateful to have a job that helped me care for my family’s needs. Of course, there was not any emphasis by employers about my job satisfaction. It was up to me then, and it is still up to me now, to achieve satisfaction on my own. We need to stop relying on a company or our manager to provide a certain quality of work life. Enjoy the upcoming holidays with your families, friends, and/or coworkers. If you are scheduled to work those days, concentrate on your responsibilities for public safety and pipeline safety. Get adequate sleep and rest prior to work. Use your days off for your favorite pastimes and family events. Seek to take a long-term view of life’s blessings. I am thankful to all of you who read these articles.